Oxford manager Michael Appleton has demanded more from his players, despite watching them move a step closer to Wembley in the Football League Trophy. The U's will take a two-goal advantage into the second leg of the southern area final against Millwall next month. 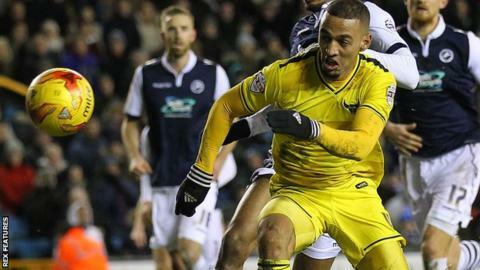 Kemar Roofe continued his fine scoring form with both goals at The Den. "We can play a lot better, but the pleasing thing is we have got another opportunity to go out and perform," Appleton told BBC Radio Oxford. Oxford's first-leg victory against Millwall came just four days after upsetting Premier League Swansea City in the FA Cup third round. Appleton's side, currently third in League Two, have a short turnaround before hosting Bristol Rovers on Sunday. "I knew it was going to be difficult for the players to get themselves up for tonight after the euphoria and impact of the result on Sunday," Appleton said. "I thought they hung in there at times, stuck to task and passed the ball OK. That's the message from me to the players. "But, you've got to be delighted coming away with a 2-0 win at a League One side." Meanwhile, Oxford have extended the loan of left-back Jordan Evans from Fulham until the end of the season. Evans, 20, has made two starts in the Football League Trophy since joining in December. Winger Jonny Giles has also been handed an extended contract until the end of next season having initially joined on a short-term contract in September.